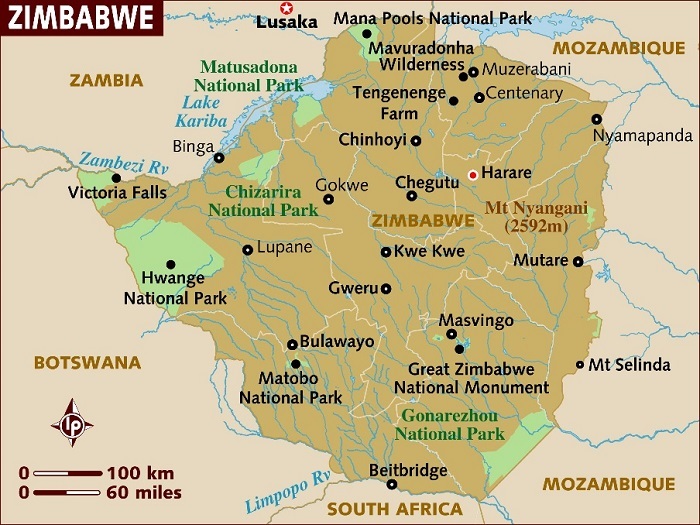 The Republic of Zimbabwe is a landlocked country located in the southern part of Africa bordered by South Africa, Botswana, Zambia and Mozambique. The country is located between the Limpopo and Zambezi rivers with a population of approximately 16 million people. Harare is the capital and the largest city of Zimbabwe. Zimbabwe is a member of the United Nations, the Southern African Development (SADC), the African Union (AU), and the Common Market for Eastern and Southern Africa (COMESA). Zimbabwe was also once known as the "Jewel of Africa" for its prosperity. India and Zimbabwe have a long history of close and cordial relations. Bilateral trade between India and Zimbabwe are around US$ 250 million (Embassy of India, Harare, 2017). As Zimbabwe follows the Look East policy, India is now looked upon as an important trading as well as business partner of Zimbabwe. There are few active firms of Indian public sector in Zimbabwe for example Indian railway Construction Company (IRCON), Rail India Technical and Economic Services (RITES) , Water and Power Consultancy Services (TCIL), etc. Indian pharmaceutical firms have a strong presence in the Zimbabwean market and Indian-made medicines are commonly found in the country too (Embassy of India, Harare, 2017). Both the country closely cooperate at United Nations (UN), Non-Alignment Movement (NAM) and other multilateral fora like the World Trade Organisation (WTO) and G-15. India supported Zimbabwe in the Human Rights Commission. On the other hand Zimbabwe supported India for its elections to the United Nations Economic and Social Council (ECOSOC), the United Nations Educational, Scientific and Cultural Organization (UNESCO), and Council of the International Civil Aviation Organisation (ICAO). The country also helped in the UN Human Rights Council elections and in the year 2011, Zimbabwe supported India´s candidates for election to the UN Advisory Committee on Administrative and Budgetary Questions (ACABQ). Furthermore, Zimbabwe supported India’s candidature for a non-permanent seat in the United Nation Security Council. Another important dimension of India-Zimbabwe relations is the presence of around 10,000 Zimbabweans of Indian origin. The Indian diaspora mostly hail from Gujarat and they have mainly engaged themselves in retail trade or export-import business. The younger generations have mostly moved out of the country for better opportunities as professionals. To the credit of the government in Zimbabwe, the Zimbabwean-Indian community since independence, has never faced any of the discrimination and hardships in Zimbabwe. Zimbabwe suffered from European exploitation and civil war for more than 90 years. The country was previously the unrecognised state of Rhodesia, a former British colony under the white minority rule, where the rights and representation of Blacks were severely curtailed. In the year 1980, there was an end to the minority rule when Robert Mugabe’s Black Nationalist organization Zimbabwe African National Union (ZANU) won a brutal guerilla war against the Rhodesian military. With the end of minority rule, the country proclaimed independence and Robert Mugabe became the first Prime Minister of Zimbabwe. He continued to be the President of the country since 1987 with one party rule till 22nd November 2017. He became the head of the ZANU party in 1970 which later re-merged with Joshua Nkomo's Zimbabwe African People's Union (ZAPU) to form the Zimbabwe African National Union – Patriotic Front (ZANU-PF). Shortly after taking power, Mugabe, a Marxist, worked on improving the lives of the largely destitute black population by increasing wages, improving social services and food subsidies. He further introduced free education across the nation and this particular reform till now remains one of his strongest legacies due to which Zimbabwe has the highest literacy rate in Africa at 85 per cent of the population (BBC News, 2000). On the contrary, Mugabe as a leader was not successful at improving the economy - as result in the year 2008, Zimbabwe had the unenvious distinction of being the world's fastest shrinking economy. The annual inflation had soared to an astronomical per cent and more than half of the population was unemployed of which Mugabe failed to take responsibility. Robert Mugabe carried the reputation of a ruthless dictator with complete disregard for human rights. In almost every election where he emerged as the leader tainted with allegations of fraud, violence and voter intimidation. He has been known to discharge his own ‘personal militia’ who ‘used violence and murder as an electoral strategy’ (The Week, 2014). However, there are many Africans both inside and outside Zimbabwe who still consider him a hero for standing up to the colonial powers. His charm and charisma coupled with his humble beginnings continue to help him connect with the ordinary man. On 15th November, 2017, the army took over the government of Zimbabwe and the President Robert Mugabe was put under house arrest as the military deployed tanks on the streets of the capital - Harare. The people of Zimbabwe have accused Mugabe of his disastrous policies in recent years that led to hyperinflation, international sanctions and economic ruin. Crises in Zimbabwe took place when Mugabe accused and fired the powerful Vice President Emmerson Mnangagwa, for acting disloyal and plotting to seize power. Mnangagwa is a former intelligence chief and veteran of the 1970’s guerrilla war against white minority rule and was widely seen as a likely successor to Mugabe. 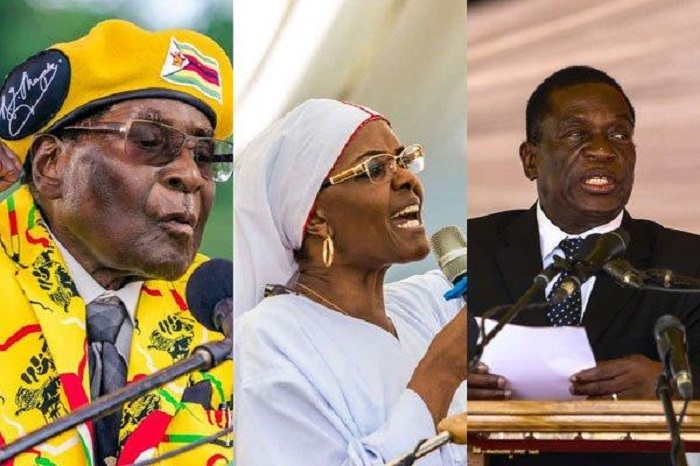 The observers saw the move as a step toward clearing the path for his wife Grace Mugabe, as the vice president, which would put the first lady in position to become president when her 93-year-old husband retired or died. Wife Grace Mugabe was mostly seen as a controversial figure because of a recent high-profile incident in which she had to ignominiously flee from South Africa after allegedly beating a fashion model. Also, she had the backing of many younger members of the party. To this, the Gen. Constantino Chiwenga who is considered to be a close ally of Mnangagwa’s, called a press conference, denouncing moves to purge members associated with the liberation history. And, if the purge did not stop, he warned that the military will not hesitate to step in. The General was also considered by many a possible future Vice President of Zimbabwe. Later on, signs of military intervention were seen, with tanks near the capital. The situation escalated with the early morning announcement, when Maj. Gen. S B Moyo addressed the country on state TV, vehemently denying the operation was a coup. In contrast to West Africa, southern Africa rarely sees coups. But this time the Zimbabweans gathered in huge number to march against Mugabe. On the 19th November, the Zanu-PF Youth League, which Grace Mugabe leads, called for her expulsion from Zanu-PF forever. They also demanded the president to resign as leader of the country and party; condemning the unceremonial dismissal of Mnangagwa sacked by Mugabe (Tendai Marima, 2017). Outside the parliament and presidential offices, the civilians was seen giving hugs, and taking selfies with army personnel. The capital witnessed a congenial mood to such reaction of the military where people played loud music and danced after marching to State House to demand Mugabe's resignation. They described the day as historic and a day of freedom. Soon after ZANU-PF dismissed him as its leader, Mugabe was asked to announce his resignation to the nation. But Mugabe stunned the people by making no mention of resignation in a television address, defying his own ZANU-PF party, which had already sacked him. On 21st November, Robert Mugabe resigned as President of Zimbabwe when the parliament began an impeachment process to end his near four decade-rule. Wild celebration broke out at a joint sitting of parliament when Mugabe’s resignation was announced. The speaker Jacob Mudenda suspended the impeachment procedure and declared that Mr. Mnangagwa popularly known as the ‘Crocodile’ would be the next President of Zimbabwe until elections due next year. Speaking to a crowd which had been waiting for him at the headquarters of the ruling Zanu-PF party, Mr Mnangagwa began by reminding people that he had been sacked by Mr. Mugabe and had fled to South Africa because of threats to his life, including an alleged poisoning three months ago. Before leaving from South Africa to Zimbabwe, he met President Jacob Zuma. On reaching Harare he was driven in a motorcade to the party headquarter. A huge crowd gathered welcoming the new hero of the country with a slogan – ‘Welcome Back Our President’, ‘Thank You for Your Endurance and Fortitude’ (Kim Sengupta, 2017). Mnangagwa in a brief speech promised to provide jobs to for everyone and praised the military commander who had carried out the coup General Constantino Chiwenga, by saying that he had managed the whole process very peacefully. In the meanwhile, China’s role in Zimbabwe was once again in spotlight. The Zimbabwe’s top military commander had met with his Chinese counterpart in Beijing early this month. Thus, many regional observers suspect China had a hand in efforts to dethrone Robert Mugabe who wanted to stain and derail China-Africa relations. There were few experts of the opinion that the downfall of Mugabe took place from favor with China’s Communist party leaders in recent years, with Beijing particularly alarmed at the prospect of his wife, Grace Mugabe, succeeding him. However, China denied its connection with the political crisis prevailing in the country. The downfall of Robert Mugabe led to scenes of triumph in Zimbabwe. The Chairperson of the African Union Commission, Moussa Faki Mahamat, welcomed the decision by President Robert Mugabe to step down and appreciated the peaceful transfer of power in Zimbabwe. Throughout the years, the people of Zimbabwe have demonstrated remarkable resilience and resourcefulness, and commitment to their country. The Chairperson of the Commission is confident that they, together with all their leaders, will remain steadfast in their commitment to fulfill their legitimate aspirations. The United Nations Secretary-General Antonio Guterres encouraged Zimbabweans to "maintain calm and restraint" after Mugabe's resignation. The Democratic Alliance, South Africa's main opposition party, called the resignation "a victory for the people of Zimbabwe who have suffered greatly under the latter years of Mugabe's reign". In Britain, Zimbabwe's former colonial power, Prime Minister Theresa May mentioned that the news of Mugabe's resignation was an opportunity to "forge a new path free of the oppression that characterised his rule". The United Kingdom Foreign Minister Boris Johnson said that he does not regret Mugabe's downfall and his resignation is a moment of hope for the people of Zimbabwe. On the other hand, the United States State Department released a statement congratulating the people of Zimbabwe. The embassy came out with a statement where it said; “Zimbabwe has an historic opportunity to set itself on a new path. Through that process, the United States urges unwavering respect for the rule of law and for established democratic practices” (Al-Jazeera, 2017). For India, although the bilateral trade between the two countries are only around $250 million, the stakes are modest. India - Zimbabwe trade and investment engagements are likely to continue in the mere future as it is evident that it will bring positive results for both countries. India should continue to engage with Zimbabwe to ensure that the nations benefits from the expansion and growth of both India and Zimbabwe. Thus, India has begun investing more seriously in Africa over the past decade, so there are strategic reasons for India to follow the events closely in Zimbabwe. Resignation of Zimbabwean President Robert Mugabe was greeted by hopes of better times for the nation's people. There was no voice of regret at his removal. The election of the new president has unleashed extraordinary hopes as hundreds of thousands of Zimbabweans have joined hands to rebuild the nation to its full glory. • Kim Sengupta, 2017: ‘President-elect Emmerson Mnangagwa hails 'new democracy' for Zimbabwe - but doubts remain over Robert Mugabe links’, Independent. 22nd November, 2017. (http://www.independent.co.uk/news/world/africa/zimbabwe-president-robert...). • Nelson, 2017: ‘Army takes over the government of Zimbabwe seizes power from Mugabe’, My State News. November 15, 2017(https://mystatenews.com/army-takes-over-the-government-of-zimbabwe/). • The Week, 2014: “Robert Mugabe: from freedom fighter to fearsome dictator”. (http://www.theweek.co.uk/africa/61512/robert-mugabe-from-freedom-fighter...).